The tools have been field tested for reliability and validity and include user-friendly rating scales and marking schemes for speaking, listening, reading and writing. 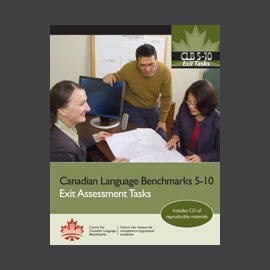 In 2004, the Centre for Canadian Language Benchmarks (CCLB) published Summative Assessment Manuals (SAM) for teachers, developed by Grazyna Pawlikowska-Smith, the author of the CLB 2000. Funded by the Government of Alberta and Citizenship and Immigration Canada, the 2004 version of SAM came in two separate volumes. Based on the results of a survey conducted in 2009 with practitioners who use SAM, the CCLB, with funding from the Government of Alberta, has re-formatted SAM to make it more user-friendly. 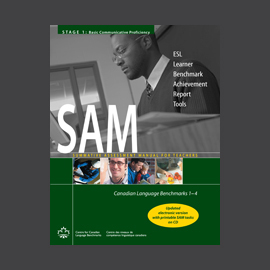 The revised version consists of a printed manual containing important information on using SAM and includes two CDs: one with the SAM tasks and an electronic version of the manual, and the other with the audio files for the CLB 4 tasks. The new version is compact, printable and lighter than the previous two-volume set. Cost of the revised SAM is $45 plus HST and Shipping and Handling.